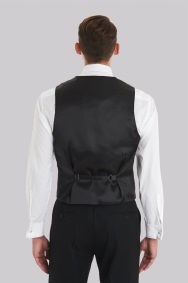 This Moss 1851 black paisley waistcoat with a matching bow tie is an ideal accessory this party season. Team with a white Moss 1851 100% cotton shirt for a luxurious look. Formerly known as Blazer. Great quality and looks exactly how you'd expect. I personally find the fabric a bit stiff on the front, resulting in the vest going out of place (being pushed up) when sitting or dancing. Nothing dramatic though. Fantastic quality and well worth the money. Excellent fit and high quality material. Although good quality and a nice looking waistcoat, it came up extremely small and despite ordering a 3 XL it was no where near the size it should have been. I was disappointed with it. Size is fitted me properly and given additional look. The cloth material is matching with bow tie and looks absolutely awesome. One more for my growing collection. Nathan was well dressed well spoken and very helpful and attentive. Even when he wasn't serving me, he was still making sure that if I needed assistance he was ready to help. He is a good ambassador for Moss Bros, and a credit to himself. 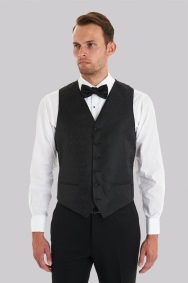 Ordered the waistcoat without realising it was a slim fit. No use for a 69 year old with a larger than average waistline. Will stick with a cummerbund. for now. Good packing and arrived very quickly. Items appear to be of good quality and fitted very well. Quality of waistcoat was excellent, as described. However sizes were very small indeed. I am an average male who always takes a large. For the first time in my life I had to have an XXL to make it fit! Item had false pockets - this was not explained in the description. Useless as a waistcoat.